Samsung, a Korean multinational giant conglomerate, claims that such daily inconvenience may soon disappear thanks to Samsung Pay, a mobile payment system which was launched three months ago by Samsung Electronics. “Samsung continues to work towards converting plastic cards into digital ones. We will enable people to use a digital one, Samsung Pay, instead of a wallet,” said Lee In-jong, the Vice- President of Samsung Electronics at the Mobile World Congress 2015. In reality, Samsung Pay has gained much popularity in Korea. The number of users has already reached the two million mark, and the grand total of payments totaled 100 billion won two months after it was released. However, there is some doubt whether the company will see continued success in the long run. Attempts to create a mobile payment service had already been under way before the development of Samsung Pay. Numerous mobile-service companies created mobile wallets for membership cards and discount coupons previously. Then debit and credit cards were also digitalized, making direct payment possible through smartphones. Credit card companies provided customers with what they call “app card” services, which provide a barcode that can be scanned for payment. Web-based mobile payment services like Kakao Pay or Naver Pay also appeared, making online payment much more convenient. However, all these services had limitations when using various kinds of cards, and customers had difficulties using them in offline stores. In 2011, however, Google Wallet, a mobile payment system developed by Google, provided users with a service that works with tap-to-pay Near Field Communication(NFC) readers. NFC is a communication technology that enables people to exchange wireless data over short distances within ten centimeters. The short distance makes transactions safer, so the NFC technology is widely used in mobile payment systems including Apple Pay, Apple’s mobile payment and digital wallet service. Samsung Pay is also a hardware based mobile payment service using NFC, but it is different; Samsung Pay works not only with NFC readers but also with magnetic stripe card readers by using Magnetic Secure Transmission(MST) technology. The MST technology emulates the process of swiping a traditional debit or credit card on a payment terminal. MST allows Samsung Pay users to make purchases by simply waving the smartphones fitted with the mobile payment solution over conventional payment terminals. Also, Samsung’s fingerprint recognition technology and tokenization appeases its concerns in terms of payment security. Users have to certify their identity before making purchases through fingerprint scanning. Furthermore, credit card information is stored in a secure digital token and whenever payments are made, virtual transaction numbers are used. If the digital token information is disclosed, people’s personal security information is not likely to be stolen through the service, tokenization. Before the appearance of Samsung Pay, other mobile payment services like Apple Pay used NFC technology. A NFC terminal reading credit information on a NFC chip on mobile phones was needed for other mobile payment services like Apple Pay, but the NFC reader has not yet been widespread. On the other hand, as MST works on a magnetic stripe card reader which is common in Korea and North America, the users of Samsung Pay can use it in most stores. According to Kim Bum-soo, a Research Associate of Hyundai Research Institute, Apple Pay cannot be used yet, but Samsung Pay can be used in most stores that allow payment with credit cards in Korea. Also, while Apple Pay can be used only in 10 to 15 percent of stores, Samsung Pay can be used at 85 to 90 percent of stores in the United States. MST is the distinguishable characteristic of Samsung Pay. “Samsung Pay has overcome the limitation of existing mobile payment services that do not work anywhere. The rate of reuse for Samsung Pay reaches near 80 percent, while the rate for Apple Pay is just 23 percent. The statistics indicate that Samsung Pay could replace the physical wallet for the first time,” said Kim. According to Kim Bum-soo, the scale of global mobile payments is expected to grow from 431 billion dollars in 2013 to 721 billion in 2017. 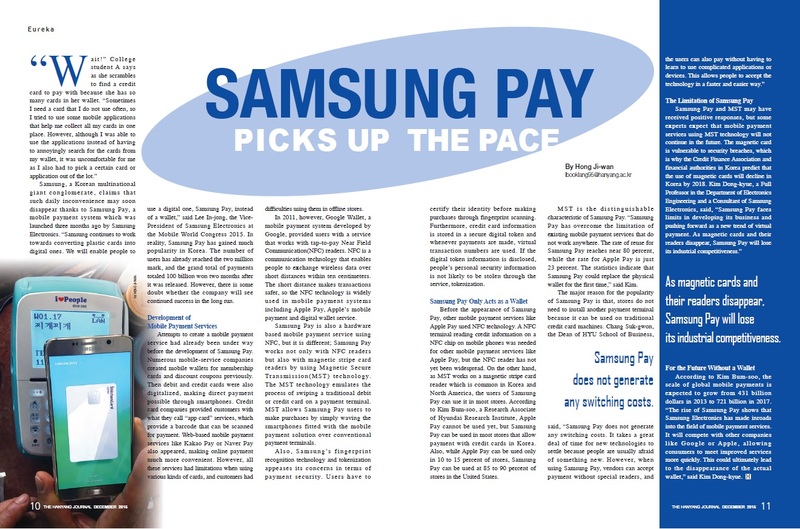 “The rise of Samsung Pay shows that Samsung Electronics has made inroads into the field of mobile payment services. It will compete with other companies like Google or Apple, allowing consumers to meet improved service more quickly. This could ultimately lead to the disappearance of the actual wallet,” said Kim Dong-kyue.